The prophet Isaiah speaks words of encouragement to a people who’ve been through disaster and see no light at the end of the tunnel. “Be strong, fear not! Behold your God …will come and save you.” He paints for them images of eyes being opened, lame men leaping, and waters quenching the desert places. Mark’s Gospel shows Jesus at work as the saving presence of God among the people as he heals a girl from an unclean spirit and cures a man who is deaf-mute. The little girl’s mother was a “foreigner” who would have been considered by Jews as outside of the saving reach of God. But by putting her to the test, Jesus’ lifts up her example so that his fellow Jews may see the faith of a foreigner that seeks and receives the help of God. In the James passage, we are challenged not to have favoritism among ourselves based on human standards and appearances – in this case favoring the rich over the poor. This is a form of judging our neighbor rather than loving them as we should. He goes on to point out that our actions speak louder than words. If we have genuine faith, it is not what we say but what we do that will reveal the genuine nature of our faith, for better or for worse. Comment: Perhaps the combined import of these lessons is to challenge us to be the living, active signs of God’s saving presence by the love we show to our neighbor. And the neighbor here defined is not limited to people who are comfortable for me to engage, but especially those who differ – the foreigner, the poor, people pushed to the fringe. In our current American scene, this would also seem to imply the call to love those who hold differing political opinions. God’s circle of love is always larger than the one I wish to draw! Monday: 9:00 a.m. - 1:00 p.m.
Tuesday - Thursday: 9:00 a.m. - 2:00 p.m.
Friday: 9:00 a.m. - 1:00 p.m.
A more informal Eucharist, including praise and worship music lead by the Arise music team, readings from the scripture, a time for prayer, a message from one of our pastors and the Holy Communion. A classic worship service complimented by our choirs, organ and visiting guest musicians in a rich offering of musical traditions. St. Matthew's is equipped with a hearing loop. St. Matthew's is wheelchair accessible. Map and Directions to St. Matt's. Our complete Holy Week Worship schedule is online. 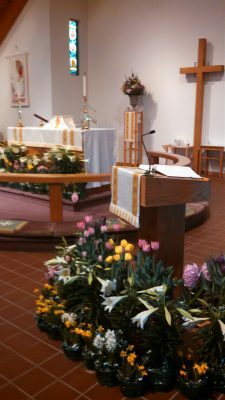 Visiting Saint Matthew’s for the first time on Easter? Look at our Easter page for some commonly asked questions.